Jabra EVOLVE 75 Stereo MS Headset is optimised for Skype for Business. It uses HD Voice that delivers crystal clear communications for calls received or made and high quality music. This headset is capable of shutting out office noise, which in the pocess can increase user’s productivity. It features an active noise cancellation that can easily be switched on and be able to virtually eliminate low-frequency sounds, including rustling papers and hum of air conditioning. In order to counter and monitor ambient noises and reduce interruptions, the device uses advanced microphones in addition to its Active Noise Cancellation feature. What acts as a “Do Not Disturb” sign in the devices is its superior ANC and integrated busylight. 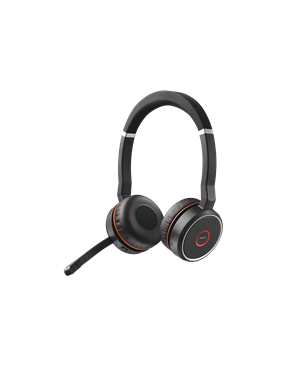 Providing more freedom to its users, the Jabra EVOLVE 75 Stereo MS Headset has dual Bluetooth connectivity allowing the device to be connected to two other devices at the same time, which can be used both for calls and music. Users have the flexibility to move up to 100 ft. or 30 m. away from the connected device. It also offers users all-day comfort, considering it uses an on-the-ear design and leather-feel ear cushions. Beisdes its passive and active noise cancellation features, this Jabra EVOLVE 75 Headset also has a listen-in feature that allows users to listen in around the room and avoid missing important announcements. Users simply have to press the left ear cup of the headset in order to hear the outside world, which means that they don’t have to take of their headset just to do it. There are also red lights installed on both of the ear cups, which are automatically activated when the user in on an active call. It can aalso be manually activated by users when busy and in order to act as a “Do Not Disturb” signal. A subsidiary of GN Netcom, Jabra is a reliable developer and manufacturer of corded and wireless headsets perfect for mobile device users, as well as professional ones, including contact centres and offices-based usage. The company came from a Utah corporation named Norcom Electronics Corporation founded by the entrepreneur Elwood Woody Norris in the year 1983. The company was then acquired by American Technology Corporation after a year and was sold to Norris Communications, Inc., also founded by Elwood Norris, in 1988. After that, the company spun off its assets to Rangy Granovetter, and together with Brean Murray, founded Jabra Corporation in the year 1993. Jabra Corporation is recognised to be the very first to develop in-ear integrated microphone and speaker. The company also developed and patented EarGels, a developed DSP-based echo and noise cancellation technology that can improve productivity. It has introduced a lot of innovative offers throughout its operations, including over-the-air headset tuning.